Trailcraft Cycles is a small, family-based business located in beautiful Fort Collins, Colorado USA. Trailcraft frames are hand built in small batches in Taiwan, and each bike is fully assembled in Fort Collins, Colorado for you when you place your order. Their mission is to build the highest quality bikes with unprecedented attention to detail and create a personalized shopping experience. 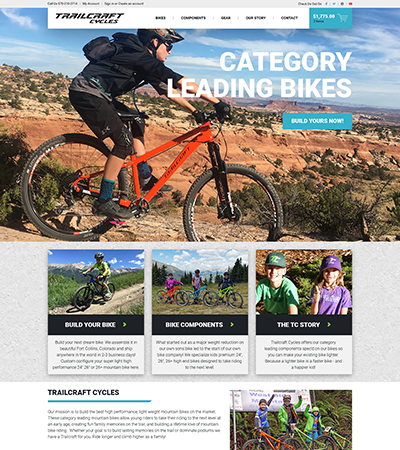 Trailcraft Cycles originally approached Folsom Creative with a request for an updated web design to improve search engine rankings and increase organic traffic exposure. Upon seeing the success of the new website, Trailcraft began to task Folsom with graphic design and online advertising work, eventually granting Folsom with full control over advertising strategy and implementation. In this short period of time, Trailcraft's monthly revenue has approximately doubled.